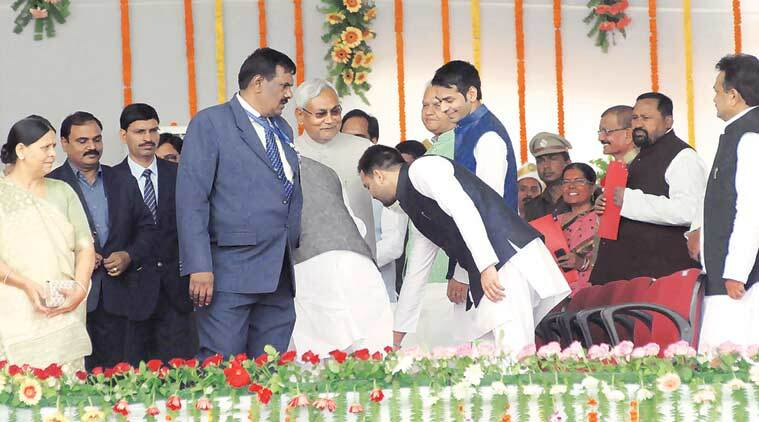 RJD leaders, however, are sure this marks a break from the past. Tejashwi is projected by his party as an “articulate leader” who walked out of Delhi Public School (R K Puram) in Class 9 to focus on a future as a cricketer before turning to politics. Tej Pratap, meanwhile, is described as the “soft-spoken” owner of a motorcycle showroom and a “devotee of Lord Krishna” who stuck on in school till Class XII. Insiders say it was not easy for Lalu to decide on his younger son as his political heir. What worked in Tejashwi’s favour, leaders said, was how he began to pick up the pieces after the RJD’s crushing defeat in the 2010 Assembly elections when his father’s party could win only 23 of the 243 seats. “We used to discuss politics and the need for change in the RJD. We talked about what went wrong and how it could be fixed. Tejashwi later invited me to work for his party. I have been associated with him since 2012,” said Sanjay Yadav, a close friend of Tejashwi and who worked as one of his main strategists for the 2015 elections. From 2013, Tejashwi started travelling to various districts, addressing the party’s youth wings, talking mainly of giving fair representation to youth. Meanwhile, Tej Pratap did not appear to show much interest in politics and was often seen “blessing” his younger brother as he set out for a political engagement. Soon, Tejashwi started taking on his political rival “chacha” Nitish, declaring during a public meeting in Samastipur: “Baap aur beta milkar Bihar chamka denge (Together, my father and I will make Bihar shine)”. While Tej Pratap remained “the quiet insider” with a passion for cars, Tejashwi took up the cudgels on behalf of his father following Lalu’s conviction in a fodder scam case. “Lalu Prasad is a phenomenon and cannot be written off,” Tejashwi told reporters. On the other hand, it was after his father joined hands with Nitish this year that Tej Pratap finally started to show an interest in politics, hiring professionals to give his image a makeover, online and otherwise. He declared that he would contest from Mahua much before Nitish even decided to allot the seat to him. But then, even as his team worked out strategies and slogans, Tej Pratap, unlike Tejashwi, preferred to stay away from the stage and the mike as much as possible. Their stories may be different but their election affidavits show that there’s nothing much separating them in terms of wealth — Tej Pratap owns property worth Rs 1.12 crore and Tejashwi Rs 1.4 crore. Then again, both secured big wins this time. Tejashwi defeated BJP’s Satish Kumar by 22,733 votes in Raghopur, a seat that had been held by both Lalu and Rabri Devi in the past. Tej Pratap trounced HAM’s Ravindra Ray by 28,155 votes in Mahua.